Calling all Rock Stars! Guitars & Stars Rule this bow! The bottom layer is a 2.25" hot pink grosgrain ribbon, then a 1.5" white grosgrain ribbon that has guitars and stars all over. There is a black sheer ribbon that goes through the center, topped with 2 layers of 3/8" grosgrain ribbon that are white with pink, black and silver stars. There is shimmering sparkles on all the silver stars. It is attached to a French Clip. 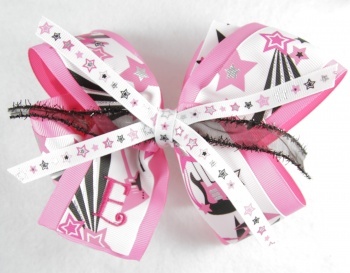 Rock yourself out with this Rock Star Guitar Bow!